Master Blaster from Metro great fro drying your vehicle !! no more arm ache or chamois to buy no streaking- Blast water off your bike or anything wet with this high-speed, 4 H.P. motors) dryer of sturdy, all-steel construction. Features 2 stage dual fan with two speeds and two temperatures. A 10" by 1.5" inch commercial-strength flexible hose makes it easy to dry wet things quickly and re-direct moisture out of crevices. Weighs 16 lbs. 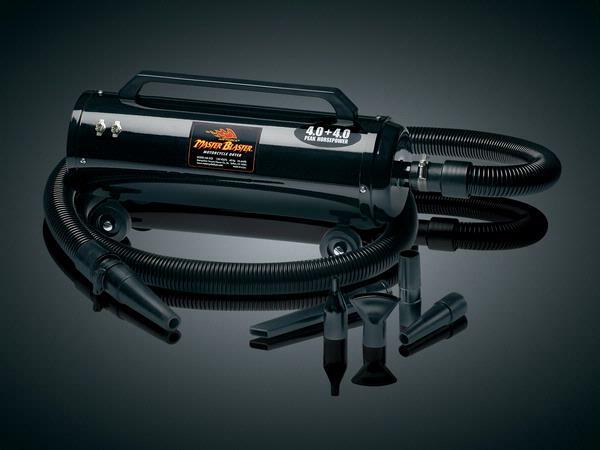 Kuryakyn Master Blaster Bike Dryer Master Blaster from Metro great fro drying your vehicle !! no more arm ache or chamois to buy no streaking- Blast water off your bike or anything wet with this high-speed, 4 H.P. motors) dryer of sturdy, all-steel construction. Features 2 stage dual fan with two speeds and two temperatures. A 10" by 1.5" inch commercial-strength flexible hose makes it easy to dry wet things quickly and re-direct moisture out of crevices. Weighs 16 lbs.